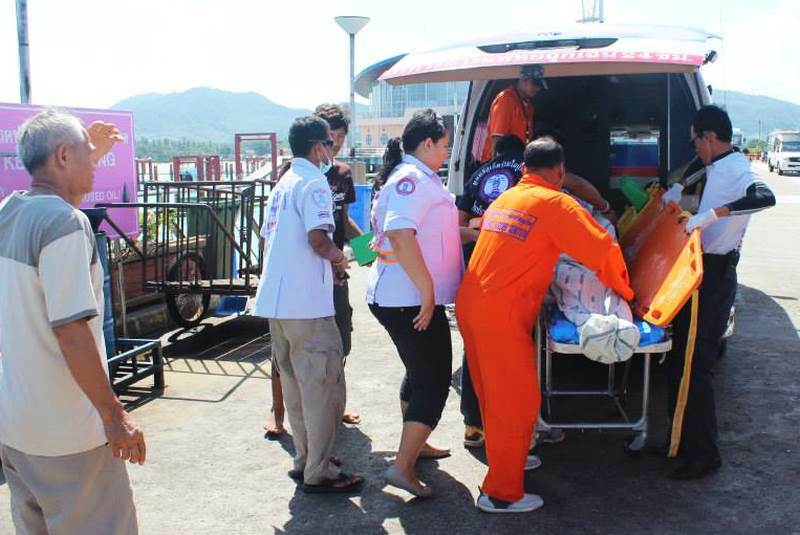 PHUKET: A Chinese tourist drowned in the waters around Racha Yai Island yesterday afternoon (October 1), the second person in four days to die at the island. Mr Lin's body is placed in an ambulance. Chalong Police said that Lin Hunhing, 30, went into the sea despite the two-metre-high waves. Police were told that when he tried to get back to shore the swell dragged him out again. Beach guards and friends finally manage to pull him out of the water, but attempts to resuscitate him failed. Pol Capt Thada Sodarak, duty officer at the time, told The Phuket News that Mr Lin went to Racha Yai with a tour company. After lunch the tourists had free time, and Mr Lin and two friends went into the sea with bodyboards. The body was brought back to Phuket and sent to Vachira Phuket Hospital for autopsy. On Saturday (September 28), Russian expat diver Denis Lipatov, 39, drowned while spear fishing in the waters of Racha Yai.